The 4-8 Band Program is one of the largest volunteer organizations in the Medfield Public Schools with an enrollment of over 250 students. Through active participation and dedication to individual and collective goals, students are offered unique opportunities for music performance and artistic expression. Our concert and jazz ensembles have been consistently recognized for excellence at numerous state and local festivals. 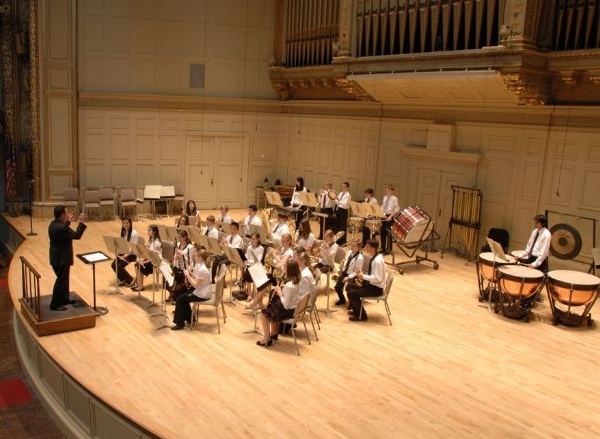 With the support of parents, teachers, administrators and the Medfield Music Association, the band program has long been a source of pride for the Medfield community. Students and parents will find many resources on this website that will help them have a successful band experience. Parents will want to look for the performance and rehearsal calendar, announcements, private lesson information, required materials, forms and advocacy links. Parents are encouraged to attend this one-time information session, providing a look into what makes band such a valuable experience for students and what you can do to support them as they transition to the middle school band program. Topics include an introduction to music learning software your child will be using at home called SmartMusic, the class expectations outlined in the band handbook, and the challenges and benefits of the music making process. Calling all BMS Band Parents! The Medfield Music Association (MMA) needs your help! Become a patron or donate your time to one of their many volunteer opportunities! Download the patron and volunteer forms and support your child's music education today!